Evolution Architectural Control System - Akwil Ltd.
Evolution Architectural Control System There are no products in this category. Mode Evolution is the ultimate in large scale lighting control systems. Flexible hardware configuration options, feature-rich software setup and multi-protocol control bring powerful controls to medium to large scale projects. Hotels, Shopping Centres, Stadiums, Churches, Cruise Ships and high-end Restaurants have all benefitted from the flexibility the Evolution Lighting Control System. Behind the scenes of every Mode Evolution installation are the Power and Processor Units. These are both dimmer power brawn and control brain, in a uniquely small enclosure. - Twelve channels of 10 amps resistive or inductive loads, user selectable for dimming/switching/1-10v operation. - Fully configurable control operation. - Multi-function dsi, dmx, m-bus, dali 0-10 volt and contact operation. - Astronomical time clock built in. - Intelligent self monitoring power supply. - Self program on installation facility for multi-unit applications. - Factory set default operation for quick installation / testing. - Circuit protection individual 10 amp type c mcb for each channel (2 per phase). - Emergency outputs fixed live mcb protected outputs for maintained emergency supplies. - Supply input 200-250 volt 50-60 hz. 40amp maximum. (110-120 volt option available). - Complies with EC EMC and low voltage directives (CE). - Mode products are guaranteed for two years. With a variety of power and circuit configurations and the ability to control mains dimmed, switched, 1-10v, DSI and DMX lighting with RS232 Integration as standard, Mode Evolution gives feature enabled platform from which to develop lighting control system designs. DALI control and Web interfaces are available to extend the system capabilities bringing all lighting and integration formats within the realms of an Evolution System. To get a solution designed to suit your requirements feel free to contact us here. The lighting within an installation can be manually controlled by a multi-button Control Plate. - Indicator LED's with seven user selectable RGB colours and intensity. Red, Green, Blue, Magenta, Cyan, Orange and White. The 10 Button Control Plate provides eight configurable buttons allowing scene recall, impulse and toggle and two multifunction buttons providing On & Raise and Off & Lower with integral IR receiver. All buttons have integral RGB LED's. The indicator LED's within the buttons are RGB and dimmable, therefore seven colours of selectable intensity are available. Where buttons have a multifunction i.e. Toggle On & Off, the LED colour can toggle, say Green & Red to provide current status. Evolution is a versatile and highly configurable architectural control system designed for both lighting and peripheral management. Evolution is uniquely adaptable, making it an ideal choice for use in a vast number of applications including modern smart homes, shopping centres, restaurants, hotels, cruise ships, boardrooms, hospitality suites and offices. System features include RS232, DMX, DSI and 0/1-10v controls. A built-in astronomical clock facilitates events triggered at any time of day, linked with sunrise - sunset calculations or by user definable seasons. Any input may control any output with the ability to provide operation of a sequence of events, for example, control of lighting, blind motors, commands to building management systems, colour changing etc. Unique features such as self-program-on-installation and distributed intelligence make the Evolution simple to install and maintain. 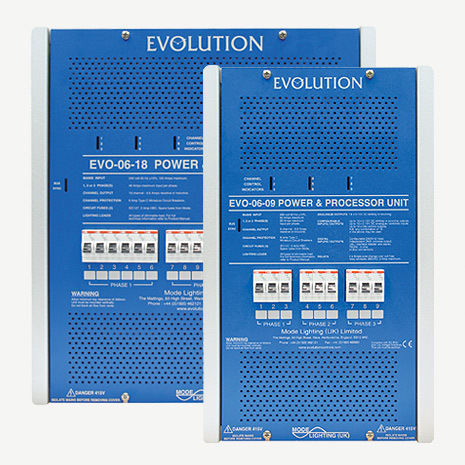 The Evolution power and processor unit builds on the quality and reliability of Mode product designs and offers high specification control and power management in a mechanically, electrically and thermo dynamically designed unit. All Mode products are guaranteed for a two year period. 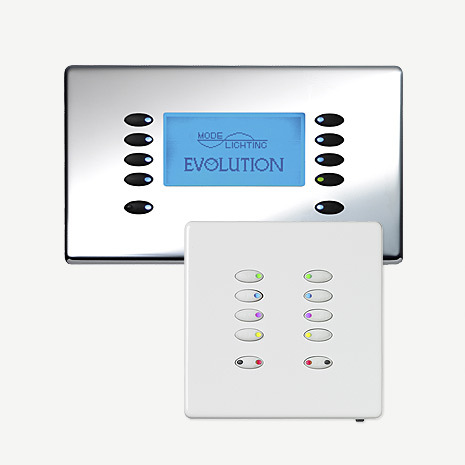 Evolution is a fully scalable control system offering control of lighting and auxiliary loads with DMX, DSI, 1-10v, RS232 and astronomic time clock control built in as standard. The Trailing Edge Power and Processor Units are designed specifically for the control of trailing edge controllable loads ie certain electronic LV transformers, filament lamps and the latest generations of dimmable low energy lamps and LED drivers. Do you have a question about one or more of our Evolution Architectural Control System products? Click below to contact us.